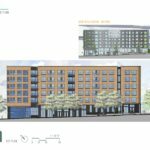 A mixed income development on Riveplace Parcel 3 has gone before the Design Commission for its second Design Advice hearing. 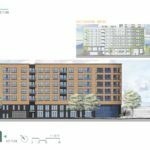 The project by Ankrom Moisan Architects will include two buildings: a 14 story west building with 209 units of affordable housing; and a 6 story east building with 162 units of market rate housing. 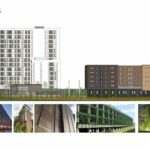 The project is being jointly developed by San Francisco based affordable housing provider BRIDGE Housing and Portland based Williams & Dame. The landscape architects are Lango Hansen. 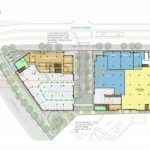 The ground floor of the east building will include 12,880 sq ft of retail space, which could be occupied by a neighborhood scale grocer. The east building will also contain 16,460 sq ft of “maker space”. 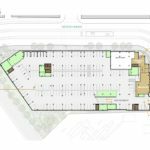 Vehicular parking will be shared between the two buildings, with 163 spaces provided for the residents and 39 spaces for the retail spaces. Over 500 bicycle parking spaces will be provided. Riverplace Parcel 3 is the last remaining undeveloped piece of land at Riverplace. The area at the south end of Downtown has been gradually developed by the City since the mid 1980s, on land that formerly included a Pacific Power & Light steam plant. A Hyatt House hotel, also developed by Williams & Dame, is currently under construction on the parcel directly to the north. Keep pushing this corner building. You’ve taken it a long way from what it was before, and it works a lot better, but probably [needs] just another couple steps. It’s a little confusing to the right: it seems like you’ve got too much stuff coming vertically down. It seems like it would be better if it floated more, had more glass. 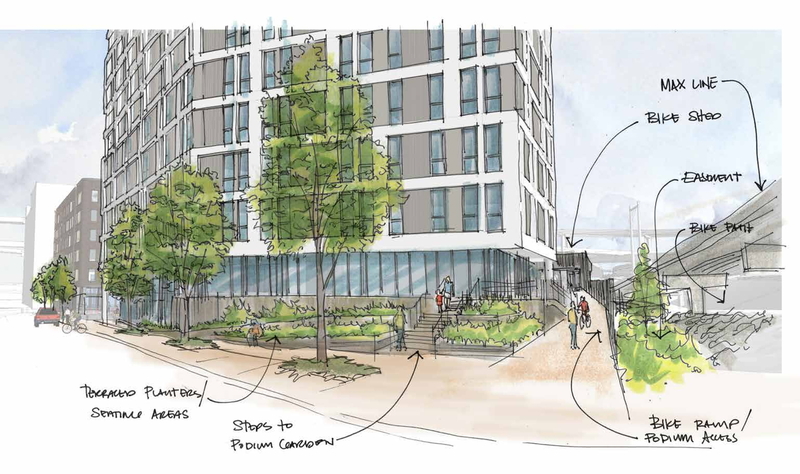 As is also the case for the 14th & Raleigh affordable housing project, Riverplace Parcel 3 will be eligible to submit for a Type IIx Design Review, where the decision is made by Bureau of Development Services staff. This is allowed under a recent code change passed by City Council, where affordable housing developments receiving direct City subsidy have the option of going through a lower level of Design Review than is typically required in the Central City. This entry was posted in Ankrom Moisan, Bridge Housing, Downtown, Lango Hansen, Riverplace Parcel 3, Williams & Dame. Bookmark the permalink.